However little we really know of the Sasanian Empire, it was a major world power and it was written about at some length, so we have a fair amount of external sources even though nothing internal seems to have survived. On pre-Islamic Arabia, by comparison, we have really next to nothing. Histories of pre-Islamic Arabia were compiled by Arab historians writing after the rise of Islam, but these are obviously written too late to be considered primary material, and they are written through the historical lens of Muhammad’s activity so they aren’t really intended to provide a comprehensive or neutral look at Arabian history. Indeed, these later writers would refer to the pre-Muhammad period in Arabia as the “period of ignorance,” or Jahiliyah, from Arabic root jahal meaning “ignorance,” so you get a pretty good idea of what they thought of pre-Islamic Arabia. What we know apart from those later histories comes from contemporary outside accounts, the hodgepodge of rock inscriptions that have survived throughout Arabia, and archaeology. Arabia (and “Arabia” in this context means both the Arabian peninsula and the Syrian deserts to its immediate north, which geographically can’t really be separated from the peninsula and where nomadic Arabs roamed freely) was always on the fringes of the nearby great powers of the day, be they Egyptian, Mesopotamian, Persian, Greek, or Roman, but that’s not to say that Arabians (and I use the term “Arabians” because Arabia was likely home to a number of peoples in addition to the one(s) that became what we know as “Arabs”) were not important to the ancient world. Early Greek sources note that they acted as merchants, both for trade from India that passed through the Persian Gulf on its way west and for aromatics (i.e., incense) derived from plants that were native to Arabia, and that they were frequently employed as mercenaries by Near Eastern empires. Society in Arabia was divided between nomadic herders and those who had settled down as farmers and artisans, and apart from the areas that were along the trade routes from India and/or the southern part of Arabia and thus part of the merchant trade, both nomad and settled were eking out a subsistence-level existence in almost every case. The domestication of the camel had done much to shape Arabian society, as it allowed a kind of deep-desert nomadism that sheep and cattle nomads couldn’t practice. Camel herders could move further and further into the inhospitable Arabian landscape, and as they came upon oases where settlement and agriculture were possible, then settlers would follow. The relationship between the two groups was a fascinating example of interdependency combined with rivalry; nomads simply couldn’t survive without the agricultural products and crafts that settlers produced, and settlers depended on nomads for trade and even defense, but nomads were wary of having their lands and their lifestyles overwhelmed by settled society, while settled societies in the region were often the target of raids by nomadic bands. Most inhabitants of Arabia practiced a pagan/polytheistic religion, though Christianity and, in particular, Judaism made some inroads from around the 4th century CE onward, as well as a little-understood tradition called hanafiyah, which today means “true believerism” but in this context refers to monotheism based on the “true” faith of Abraham, rejecting the innovations of both Judaism and Christianity. We know very little about hanifs in pre-Islamic Arabia but it’s possible that this movement played a very important role in shaping and guiding Muhammad’s teachings. 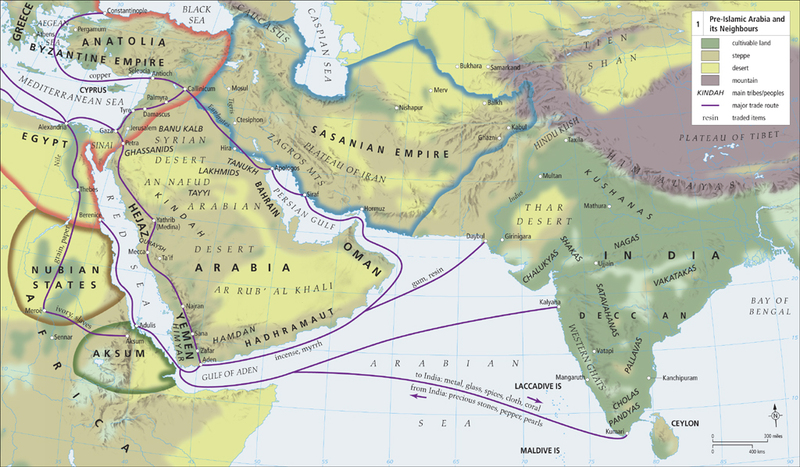 Because of the incense trade initially, then because of its strategic location along the sea lanes from Egypt to India, larger settlements first began developing in the southern part of the peninsula in the first millennium BCE. Caravan stations were the earliest major settlements, but were eclipsed by coastal port cities as the sea trade between Roman Egypt and the East picked up. The first real Arabian kingdoms (i.e., bigger than a single city-state) emerged in the southwest (the Yemen, where there was heavy migration and cultural movement to and from eastern Africa, particularly the Ethiopic kingdom of Axum) as early as 1200 BCE; Saba (fans of the Hebrew Bible would recognize this as Sheba) seems to have been the first of these. But the most important Yemeni kingdom in the first millennium CE was Himyar, which conquered Saba in around 100 BCE and survived, its rulers converting to Judaism at one point, until it was defeated by Axum in the third century. Axum controlled the area until the Himyarites regained some of their independence (short-lived though it would be) in the 6th century. The Byzantines were able to exert some influence here via the Axumites, who were also Christian and tended to be on pretty good terms with Constantinople. The north Arabian (or south Syrian if you like) desert is where we find the earliest people called “Arabs,” in Assyrian sources of the first millennium BCE, and the term is not quite synonymous with, but very close to, “desert nomad.” A number of “Arab” polities (Arab in quotes because this is how they’re described by external sources) cropped up in the Levant, usually as Roman satellite kingdoms, like the Nabateans (builders of Petra in modern-day Jordan), the Palmyrenes (in Syria, many of whom actually became Romans), the Idumaeans (in Palestine), and the Ituraeans (around Mt. Lebanon). Overall, though, the mostly pastoral society of these early Arabs didn’t lend itself very well to stable political systems. But I digress. The empires would hand out titles (Ghassanid rulers were often given the Roman title of “patrician,” for example, though by this point that title was mostly a social marker rather than a sign of any real authority) and make payments to the rulers of these tribes/kingdoms (tribal kingdoms? ), giving them both an incentive to maintain the relationship as well as money that could be distributed to any supporters who might otherwise resent their tribe’s close ties to a settled empire. These vassals could secure Arabian trade routes for the empires, as well as providing manpower for military activity (in extreme cases this included fighting each other as proxies for a larger Byzantine-Sasanian conflict) and as buffers for the empires against raids and migrations by nomadic Arabian tribes. They were unlike the earlier Roman satellite kingdoms in that these were still primarily nomadic tribes who would certainly have turned to raiding their imperial neighbors had the payments ever been stopped (the satellite kingdoms were largely settled and had their own sources of wealth). The Ka’ba in Mecca, during the Hajj. Our final consideration in pre-Islamic Arabia is the city of Mecca, Muhammad’s birthplace and the focal point of his religious, political, and military efforts. Located in the rocky, mountainous western part of the peninsula called the Hijaz or Hejaz, largely outside the spheres of influence of the two major powers and Axum, Mecca’s reputation was as a mercantile center and pilgrim destination. The traditional narrative of Islamic origins has probably exaggerated the importance of Mecca as a trading hub, making it seem like a globally important way-station on the route from India to the west, when most of its merchant activity probably dealt in locally produced goods (leather, animal products, livestock, metals, cloth, perhaps slaves), and possibly (though this is debatable) as a caravan stop on the incense trade routes from southern Arabia. These goods would be traded either regionally, at trade fairs, or on caravans to Arab/Roman/Persian frontier outposts in modern-day Syria and Iraq, and weapons, agricultural products, and wine would be acquired at these outposts to be sold in and around Mecca. Certainly there is no evidence to suggest the kind of massive wealth that would have accrued to the city had it been crucial to the Indian trade. Mecca was controlled by the Quraysh tribe, who, it’s said, were assembled from splintered familial groups around 5 generations before Muhammad and took control of the city/town/village. Mecca was regionally of some importance because it was a pilgrimage destination or haram (sacred place), home to the Kaaba, which in modern times is the focal point of the annual Islamic Hajj but in pagan times seems to have housed idols to the various tribal deities. Arab tradition holds that the foundations of the Kaaba were laid by the biblical patriarch Abraham (Ibrahim) and his son Ishmael (Ismaʿil), who established it as a place holy to the Abrahamic God before later Arabs (Ishmael’s descendants among them) came to use it in their pagan rites. The Quraysh took advantage of the Kaaba’s stature as a pilgrimage site to encourage their neighbors to come to Mecca and participate in trade fairs, and the Meccan haram served as a place where feuding tribes could come in peace to negotiate with one another, all of course in the bosom of Qurayshi traders. The Quraysh, or at least some clans of the Quraysh, began to accrue some wealth (relatively, for Arabia), and the prestige of Mecca began to grow (regionally-speaking). By the second half of the 6th century CE, it was an important and wealthy town for the Arabian context, particularly the western Arabian context. The coming of Muhammad (born in or around 570 CE) would increase its importance exponentially. Now, a brief pause before we continue with our history, because I haven’t really addressed the question: why Islamic history? There’s the flippant answer, which is that I like it and this is my blog so SHUT UP, THAT’S WHY. The obvious answer is because the Islamic World is of enormous importance in the modern world and it behooves us to understand how it got to where it is today. Related to that is the sheer improbability of the Arab conquests themselves and the fascination that holds for people like me who enjoy studying the past. Consider the Arabs, a nomadic people whose homeland was the definition of the word “periphery” when compared to the great powers of the day, who rose out of their periphery and subdued those powers in the space of about 20 years. Consider that military conquest doesn’t always mean cultural conquest, especially in the Middle East. Mongol armies may have swept from Central Asia to Anatolia in the 13th century, but the Mongols were in turn conquered by the Islamic culture they found waiting for them. Alexander’s Macedonians conquered most of the known world in the 4th century BCE, but the Hellenic culture that emerged from his empire was a combination of the Greek culture from which he emerged and the various local cultures he subsumed into his empire. The Arab conquests, on the other hand, brought sweeping change — linguistic, ethnic, cultural, and religious — to every place they visited. That’s not to say that the pre-existing local culture was completely eliminated, but it was fundamentally affected in a way that is almost unprecedented in human history, at least before the modern colonial period. That makes the spread of Islam pretty darn interesting as far as I’m concerned. But my real answer is that Islamic history is in many ways world history. The rise and spread of Islam is one of the great fundamental changes in human history, an event that was both unpredictable and shattering to the existing world order; there’s a reason why the “ancient” period in Western historiography ends with the arrival of Arab armies in Syria and Iraq. It is impossible to understand the development and rise of the West without talking about the challenge of Islam, the preservation of classical texts and knowledge by Arab translators at a time when those texts were being lost in Europe, and the impact of European expansion on Islam. The Islamic World stretches over an enormous geographic region and Islam has played a major role in the development of societies from the Niger River in Africa to the archipelagos of the south Pacific. Parts of that Islamic World served as a bridge between Europe and China and as threat and rival to both. The history of Russia cannot be told without Islam, nor can the ethnic conflicts in the Balkans be understood without learning about the Ottoman Empire. Historian Marshall Hodgson once wrote that a Martian, visiting Earth for the first time in the 16th century, would have observed that Islamic civilization either ruled the world or was on the cusp of ruling the world, so great was its reach and power. I like history, and I particularly like world history, and the scope and sweep of Islamic history appeals to me in that sense. Hopefully it appeals to other people reading this as well. Marshall Hodgson is still one of the most influential figures in Middle East Studies, even though he died over 40 years ago. Other major figures of the field have seen their work fall out of favor with the academy (either because subsequent research has shown them to be wrong or because the Orientalist biases in their research have become more apparent over time) or have really become more “sloppy, bigoted pundit” than “careful, insightful academic” (*cough*BernardLewis*cough*), but Hodgson’s three-volume The Venture of Islam is still considered a masterpiece of Islamic history, even if it’s written so densely as to drive its readers to drink. He also happens to be of great importance in the development of “World History” as part of the academy, and a collection of his essays called Rethinking World History: Essays on Europe, Islam and World History is really crucial in that respect. On pre-Islamic Arabia, Robert Hoyland’s Arabia and the Arabs: From the Bronze Age to the Coming of Islam is a relatively recent and I think pretty good effort to make sense of a very difficult topic. Before Hoyland, pre-Islamic Arabia was mostly dealt with in general works on Islamic history, like Ira Lapidus’ A History of Islamic Societies or Gustav von Grunebaum’s Classical Islam: A History 600-1258. Von Grunebaum is particularly useful for seeing where the mainstream historical scholarship was at with respect to Islamic origins before the arrival of more revisionist scholars like John Wansbrough and Patricia Crone in the 1970s and 80s. Crone’s Meccan Trade and the Rise of Islam is a worthwhile corrective on the previous, probably exaggerated, notion that Mecca was some sort of massive worldwide trade hub, though in trying to correct the state of scholarship as she saw it, Crone probably overstates what mainstream scholarship had previously argued and certainly moves too far in the other direction (she’s prone to that kind of thing). You might also try Between Empires: Arabs, Romans, and Sasanians in Late Antiquity, by Greg Fisher, but I haven’t read that one yet so I can’t say whether or not it’s worth picking up. Why don’t you put live links to the books you mention.